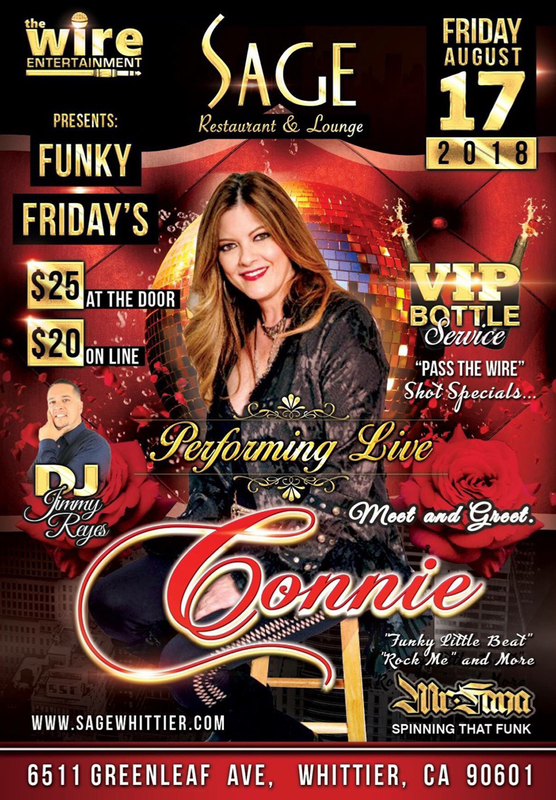 The Wire Entertainment presents: Funky Fridays featuring recording artist Connie. August 17, 2018, at Sage Restaurant & Lounge, 6511 Greenleaf Avenue, Whittier, California 90601. Meet and Greet Connie. Featuring DJ Jimmy Reyes on the Turntable spinning your favorite 80’s Freestyle jams. VIP Bottle Service and “Pass The Wire” Shot specials. Tickets available at the door or online. Come out and jam out, party like it’s 1989 and enjoy amazing food and drinks. It will be a night you won’t forget. Next Article Next Article: CONNIE LIVE THIS FRIDAY!